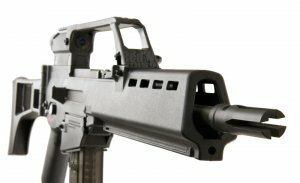 This fully licensed G36 from Umarex is all about the details; full proper markings, same polymer as the real thing (fiber reinforced plastic), full travel in the bolt. All things considered, it is the most realistic 36 available in the market today. This system features an electric blow-back bolt; it might not kick as hard as the Tokyo Marui but you can definitely still feel it and it certainly looks the part considering this version has a bolt that actually travels all the way to the rear unlike the other 36s out there. 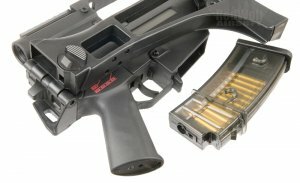 Magazine is TM compatible, internals are ARES compatible so not cross-compatible with other brands but replacement parts are not hard to get. 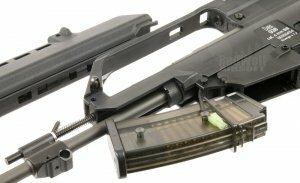 That said, the spring is still standard so you can swap it out with a higher or lower powered AEG spring of your choice. The K model is a mid length build with a carry handle running along the top with an integrated 3.5x magnification combat sight. 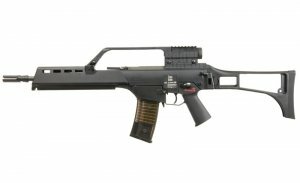 Standard G36 pattern folding stock (right side swing) and it comes with a Umarex 45 round low capacity magazine. 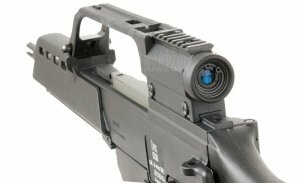 Unlike the lower powered G36C variant, this one clock in at around 400 fps out of the box making it a more middle to long range engagement type of weapon. Economically competitive, great quality, magazine commonality, integrated scope, decent range capability and skirmish ready out of the box; what more can you ask for? Disclaimer: This product is not manufactured by H&K and is manufactured by Tokyo Marui of Japan. This product is a toy only and is not a real firearm.